Please don't make too much noise because admin is sleeping. So I have created this thread to discuss today's match! Pakistan has won the toss and decided to field. Both teams are unchanged. Hopefully result will also remain the same like previous match. (10-27-2017, 08:38 PM) chacha Wrote: Please don't make too much noise because admin is sleeping. So I have created this thread to discuss today's match! although too early to say, but seems like sri lanka is not in a mood to lose this match as they are 28 in 5th over without loss. Sri Lanka is "kooting" Pakistan right now. I have a gut feeling that we will lose this match to keep interest alive for 3rd match in Lahore. By the way SL must make at least 150 if they want to win. Good batting sri lanka. This is how you rotate strike! Try to do this in ODI too, it's good. lol Sri Lanka batting collapsed. They were 2 down and all of a sudden 9 out. 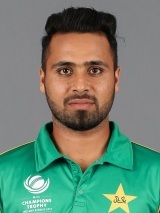 Hat trick by Faheem Ashraf! !